We have exciting news for you. Our mission station is being presented the Gabriel Radio Station of the Year Award! It is the 15th time and the 12th year in a row that KNOM has received this award, among the highest broadcast honors in North America. The Catholic Academy of Communication Arts Professionals gives these awards, in their words, “to honor works of excellence in broadcasting--programs, features, spots and stations -- which serve viewers and listeners through the positive, creative treatment of concerns to humankind. General Manager Ric Schmidt will accept this top Gabriel at the Directors Guild of America in Hollywood on October 26. If you can attend, please contact Ric as soon as possible. (Left) In 1998, KNOM's volunteer crew celebrate KNOM's sixth Gabriel. 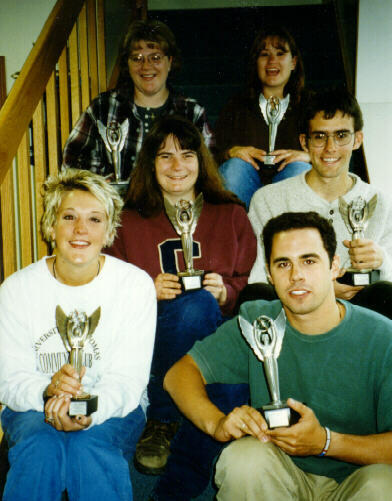 From left: Kelly Brabec, Jodi Engle, Connie Fessel, Vicki Muzik, Michael Warren and Kevin Glynn. Receiving awards like the top Gabriel is wonderful, but our greatest awards are the appreciation of our listeners, and your loyalty and kindness to us and our work. Thank you so much for keeping our mission station beaming strong! 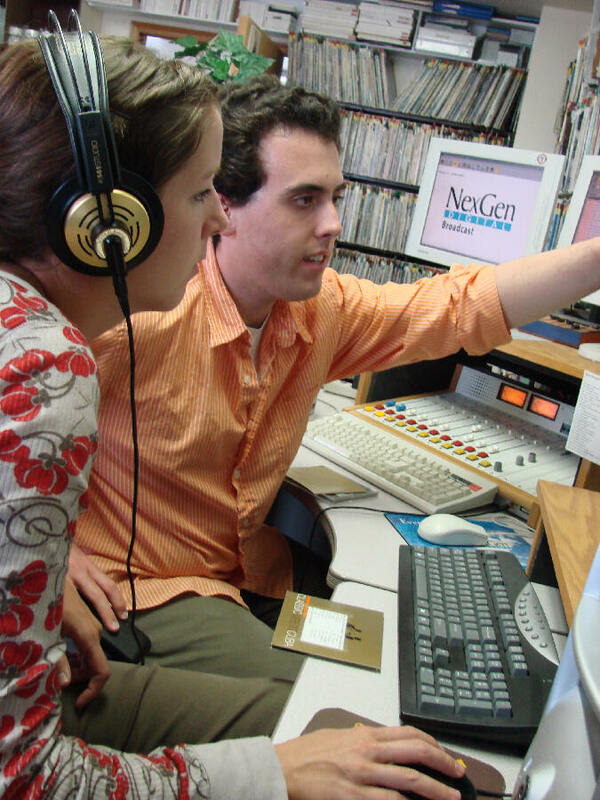 LEARNING THE ROPES: (left) Second-year volunteer Dave Dodman, KNOM’s inspiration director, teaches new volunteer Laura Davis how to edit audio. From Newport News, Virginia, Laura recently graduated from Virginia Intermont College with a degree in photography and digital imaging. What about KNOM appealed to her? “It sounded like an interesting project,” Laura says. In the Nome area, she’s bound to find many interesting photographic subjects. In her spare time, she also enjoys reading, playing the guitar, hiking and other outdoor activities. She will serve as music director as well as live on-the-air announcer. Welcome, Laura! INSPIRATIONAL SPOT: You don’t fight fire with fire. You fight fire with water. 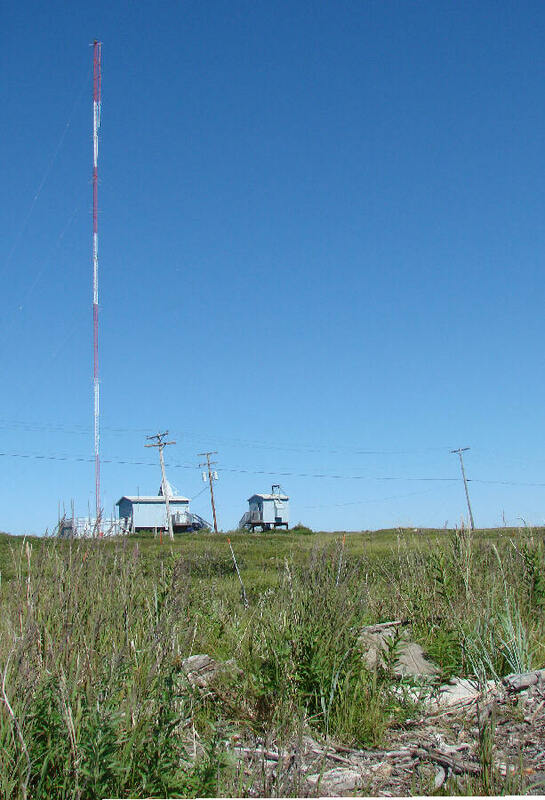 IT HAS TO BE STRONG (left) Three miles east of Nome, the KNOM transmitter site was built to survive 150 MPH winds. Does it ever blow that hard? “Maybe,” says long time general manager and engineer Tom Busch. Nome’s highest winds are generally from the northeast, and from that direction, they funnel down the Nome River valley. “I’ve been there many times when I couldn’t stand up, and we once had a small antenna destroyed by wind. It was only rated to survive 120 MPH,” Tom says. In the lower right, you can see driftwood at the high water mark of the river mouth, about 300 feet from the transmitter and generator buildings. Nome’s area is tree-less. Some of the wood is carried to the ocean by the Yukon River, and some floats across the Bering Sea from the Russian coast. PRAYER REQUESTS: Business manager Lynette Schmidt has begun a book of intentions. She writes every prayer request we receive into it, and the KNOM crew pray for them at each weekly staff meeting. And we ask you to remember the KNOM mission, our listeners, and all of our benefactors and their intentions in your own daily prayers. We hope that this will become a prayer group that includes thousands of people, most of whom have never met, but who share faith and prayer. Thank you so much. OUT OF THE ORDINARY: Among our inspirational spots is a reciting of the following Sunday’s Gospel reading. The Gospel airs about three times each day, at different times. THE CENTURY MARK: The full-time KNOM staff is small, only nine people, and they’re relatively young, with an average age of 36. Still, among them, they share exactly 100 years of radio broadcasting experience, 93 of those years in Catholic radio. We are happy to report that the mission is in caring, capable hands. INSPIRATIONAL SPOT: The next time you want something, think about what you can live without. Don’t let your earthly possessions own you…it’s stressful living a life of desire. Minimize your possessions and simplify your life. INSPIRATIONAL SPOT: When someone does you wrong, don’t do what comes naturally. Do what comes supernaturally. IT’S NEWS TO US: (left) News director Paul Korchin taps out a story in the KNOM newsroom, home for the most active news organization in bush Alaska. A KNOM volunteer in the 1980s, Paul returned in 1997 to head the news operation. Behind the scenes, Paul’s personal story is fascinating. He holds a PhD from Harvard University in ancient Near Eastern languages. 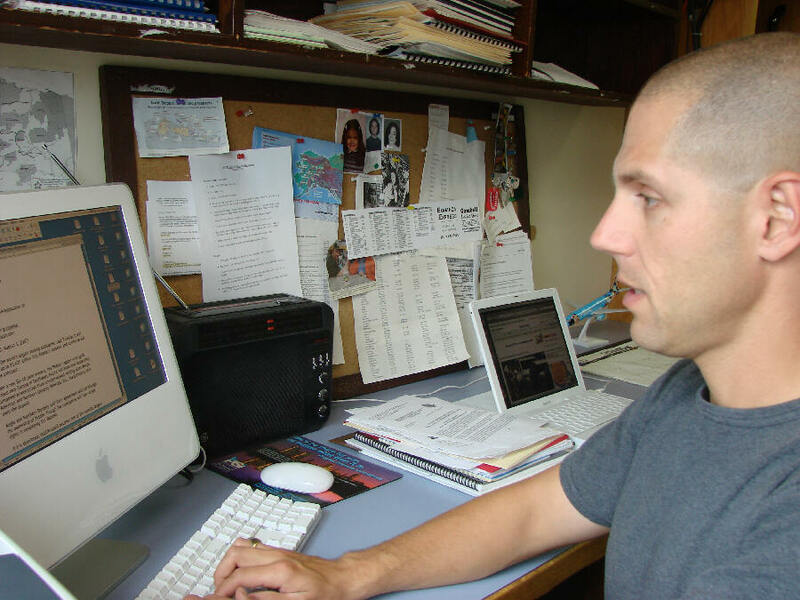 Each year, he teaches a course at Nome’s small college campus, and he writes articles for scholarly journals as a hobby. A kind, down-to-earth person, Paul doesn’t toot his own horn, but if pressed, he will admit that he can read six ancient languages with “a range of degrees of proficiency,” and is familiar with a handful of others. This past summer, he returned from five weeks of volunteer excavation at Tel Zayit, an ancient community southwest of Jerusalem. The site is important, as it’s one of the first small communities to be excavated. So far, the dig has produced artifacts dating from 1,500 BC to 800 BC. In the KNOM newsroom, Paul is hardworking and meticulous. While covering traditional news, he focuses on news that involves important issues and ways that people are working to improve their lives and the lives of others. 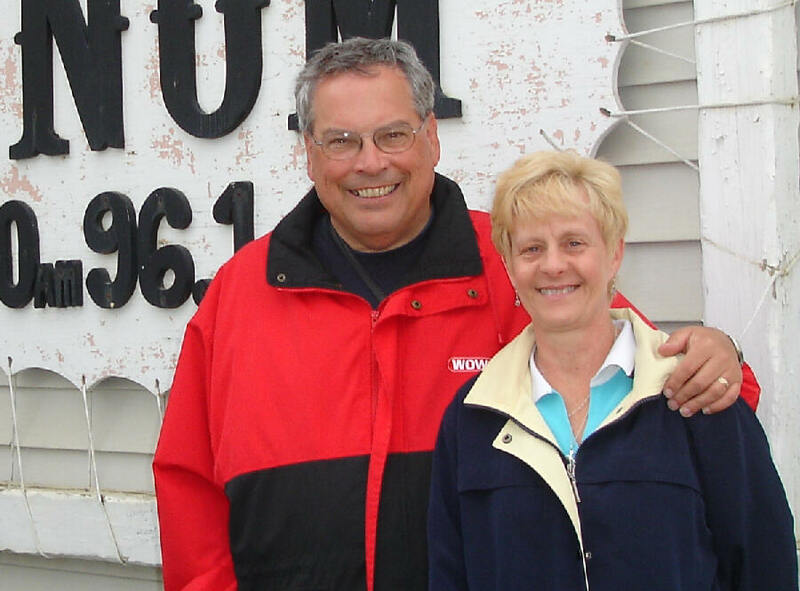 For many isolated village residents throughout 100,000 square miles, Paul’s and his staff’s newscasts are the primary, or the only, source for news about the region. Thank you for making this most valuable work possible. BASICALLY: KNOM is the oldest Catholic radio station in the United States. In order to attract a large audience — and especially the people who most need what it has to offer but would never choose a typical religious station — KNOM is programmed with a variety of popular music, plus lots of news and information, especially concerning rural, road-less Alaska. On the air 24 hours a day, KNOM sprinkles inspirational and educational spots throughout its programming, broadcasting about 68,000 spots each year. We’ve heard from many people who pray the Rosary with us each day, and who pray along with our broadcasts of the Mass. The most recent scientific survey put our daily listenership at between 76% and 100%, depending upon the village. Please consider including the KNOM radio mission in your will. We prayerfully place all bequests into funds that provide for future major improvements, or protect the mission from future emergencies. INSPIRATIONAL SPOT: It’s only when we truly know and understand that we have a limited time on earth, and that we have no way of knowing when our time is up, that we will begin to live every day to the fullest, as if it was the only one we had. BACK: After 27 years away from Alaska, we welcomed a visit by Jim and Pat Tighe, who were KNOM volunteers in the early 1970s. 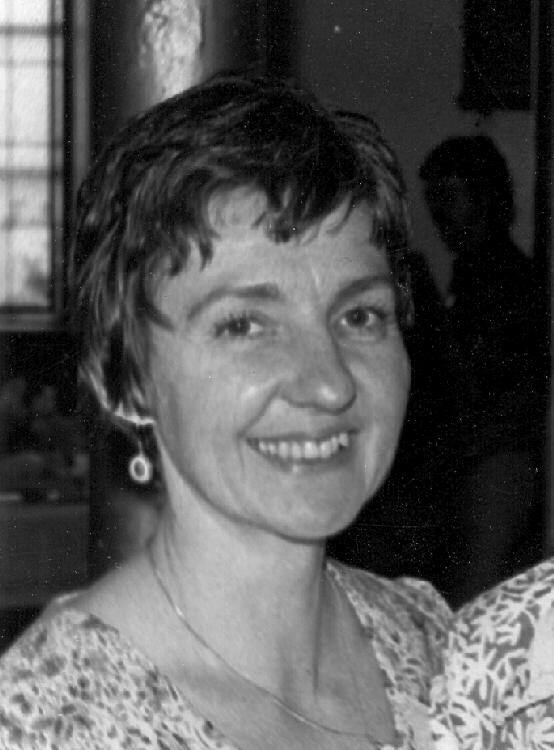 Jim served as program director from 1972 to 1974, and Pat worked as a volunteer support nurse. Today, the Tighes live in Fort Wayne, Indiana, where Pat remains in nursing and Jim is sales manager for legendary station WOWO. Still in Nome is Noralee Irvin, who now teaches and donates her salary to bank funds for the proposed Catholic radio station. 30 YEARS AGO: In September 1977, nearly constant rain and wind turns the unpaved Nome streets into thick mud. It even rains inside the KNOM studio, after the roof develops leaks. On a few clear nights, the northern lights are vivid. KNOM TO THE RESCUE: In August, the mayor of Little Diomede, Pat Omiak, was in Nome and he was worried. The incredibly isolated island’s phones were down, probably due to a circuit breaker tripping. If the system wasn’t repaired soon, its backup batteries would die. Knowing that people on the island listen to KNOM, Pat relayed instructions over the air, and the island was soon back in communication with the outside world. Thank you so very much for helping us pull through these tough times, and for supporting our work with your finances and your prayers. You, your loved ones and your intentions remain in our prayers every day. May Our Heavenly Father bless you abundantly.